Thanks to Bob Klotz for organizing the news conference and Martha Spiess for this short video. Thirty-two people from all over Maine gathered at Bath Iron Works (BIW) today for the weekly Lenten Vigil. It was very cold, windy and spitting rain during our hour-long time at the shipyard. Bob Klotz again rode his bicycle all the way from South Portland to be with us (took almost four hours). 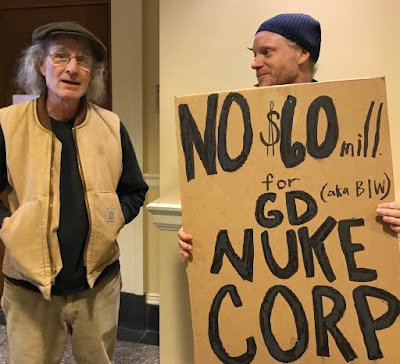 With a harmonica around his neck and a snare drum strapped to the back of his bike he made a clear reference to BIW's claim that this whole campaign to oppose the $60 million give-a-way to General Dynamics was all the work of a 'one-man band'. I learned many years ago while working for the United Farm Workers Union that big corporations like Coca-Cola (that owns the Minute Maid orange juice brand with which the union had a contract in Florida for their fruit pickers) always make big mistakes at key moments that helped rally the workers. This usually happened around contract negotiation time. 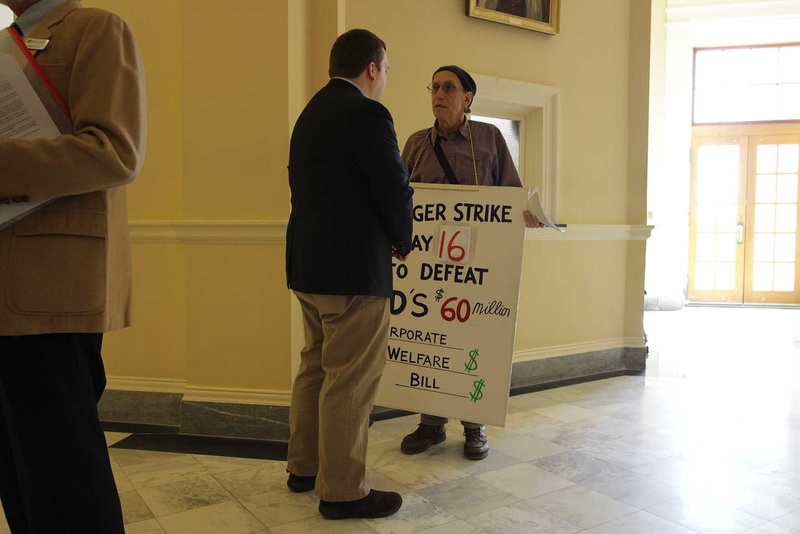 Such is the case here with this effort opposing the GD welfare they are demanding from Maine. Their attempt to discredit me - as a one man band - back fired and was an insult to legions of citizens around the state who were helping to put this effort in motion. So BIW's arrogance helped give our campaign a real shot in the arm. At the end of today's vigil we held a news conference that was coordinated by Bob Klotz and two media outlets came. 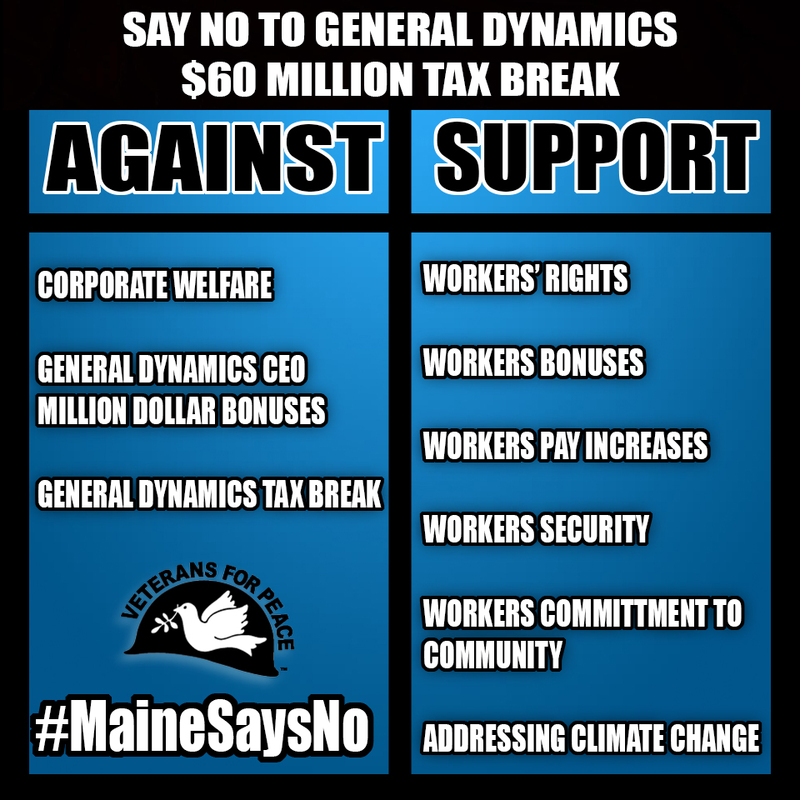 One of the speakers in the news conference was businesswoman Sarah Lachance who did a great job making the case that the corporate subsidy for GD was unfair to other Maine businesses that have to show their need to banks before they can get operating loans. GD has refused all along to open their books for review to show that they really need the $60 million they are demanding from the state when members of the Taxation Committee in Augusta have asked them to do so. Earlier in the day, at 9:00 this morning, a very popular conservative radio talk show (WGAN) interviewed Chris Busby. 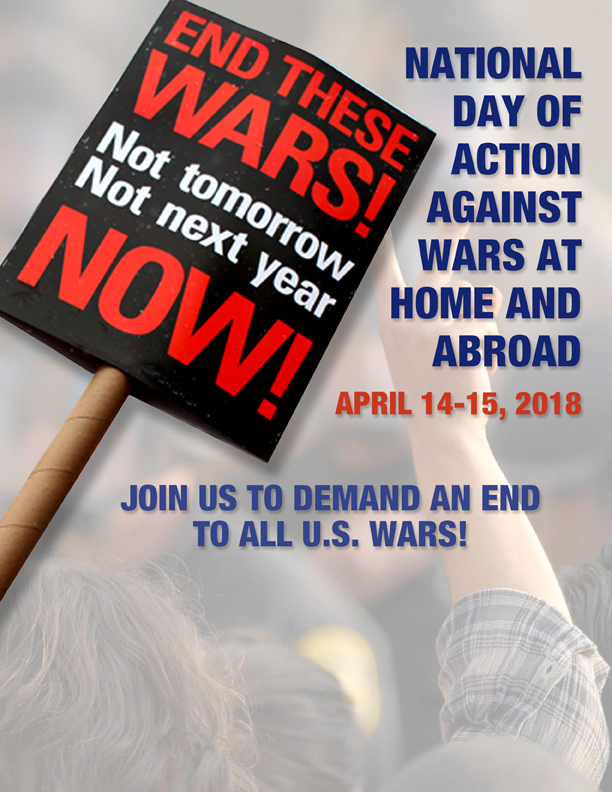 He is the editor/publisher of the very popular monthly publication that ran the front page story entitled Ship of Fools: Tax Breaks for BIW, World War III for us. I was super interested to hear how Busby would be received with his message of opposition to the GD tax subsidy and only one caller out of about 10 or so that phoned in supported LD 1781. Even the conservative talk show host was clearly opposed to the bill. This was a big deal and will go a long way in helping to further build the growing wave against this unfair corporate give-a-way. Following the vigil MB drove us and a local friend to Portland where Bob interviewed me on the public access TV program that airs in that city - Maine's largest metropolitan area. The show should be up on the air soon and we thank Brian Leonard for making that happen. So it was a busy but great day and it feels like momentum continues to grow around Maine to stop this bad bill from being approved. We urge all Mainers to keep contacting their state legislators. You can reach them here. Day 19: How things really work in Augusta - it's "the lobby"
Today I was talking with one person who informed me that he had just spoken with a long-time BIW worker who lives in a nearby town. This worker told my friend that he/she was opposed to the GD corporate subsidy bill and was going to write his/her state representative and make the case that as long as the CEO of General Dynamics was getting $21 million a year, while workers at the shipyard had no pay increases for 4 years and give-backs in retirement and pension plans, then this bill should not pass. That is powerful to hear - and I've heard the same thing from other workers while at BIW during the past two weeks. Thanks for writing to share your thoughts. 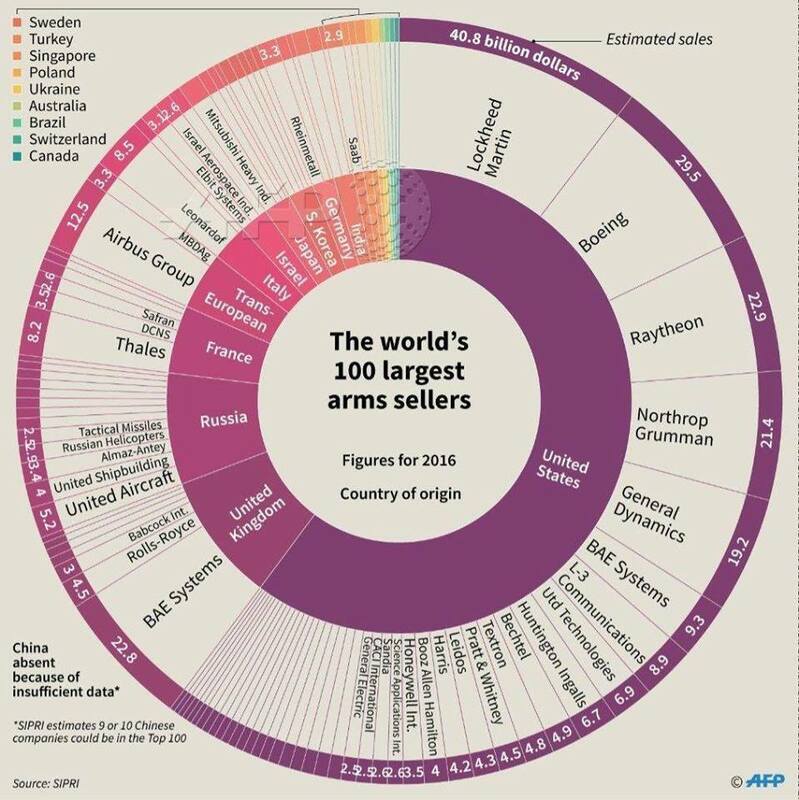 This is a very complex issue because of the way that our society has allowed military/industrial corporations to be established in multiple locations and because of the way these multi-state national corporations now work by inviting their parts to compete against each other. We cannot (and will not) compete with Mississippi, which throws 10s of millions at their GD subsidiary. 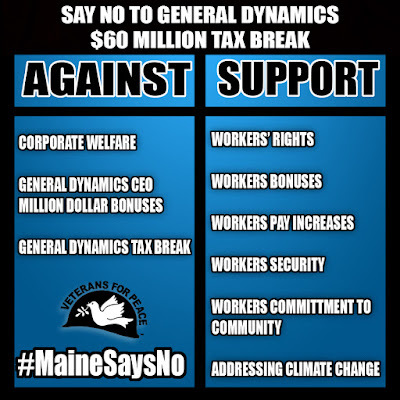 It is certainly correct that General Dynamics does not need Maine's money. It is also correct that we have many needs for our tax dollars that are not being met under the current administration. However, because all of the legislative leadership on both sides of the aisle signed on to this bill and because, I believe, the majority of the Legislature (all of the R's and enough of the D's) will vote for this bill, I am now attempting to make this the best bill that it can be. We are trying to make certain that any $$ BIW receives are tied to job retention and job growth. This way they cannot use state dollars to "streamline" their operations and eliminate jobs. We will also attempt to make this bill cost less in the long run. 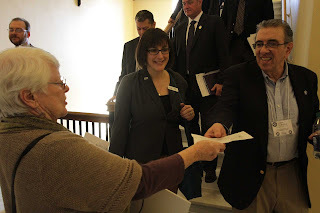 My friend wrote the representative back asking, "So will you in the end vote against this corporate welfare to the detriment of our state budget showing so many deficits?" I doubt there was a second response from the representative. Many Mainers are trying to understand why the Democrats (as you can see above clearly understand that this is a bad bill) are voting for it anyway. One state representative who opposes the bill wrote me last night with an explanation of how things really work in Augusta. The most vulnerable statehouse leaders are those who are seeking higher elected office; the others are not accountable to anyone. Thus the bottom line is that the corporate "lobby" really runs the show in Augusta - like in most places across the nation. The needs of the people are secondary to the wants of the corporate masters - Mr. Big as I like to call the oligarchy. The Democrats, who love to talk glowingly about social justice and fairness during election time, mostly fall in line because they want to advance. They go along to get along. The people be damned in the end. The options for the public are - surrender and take any crumbs that might fall off the table, or fight like hell to the bitter end. I choose to fight and thank those around the state who are doing the same. The only way to take on "the lobby" is to do it publicly without compromise. Let's see which Democrats turn tail and run when the votes are counted on LD 1781. Which country is destabilizing the planet? Good story yesterday in the Portland Press Herald about our action in the halls of the state capital last Tuesday. 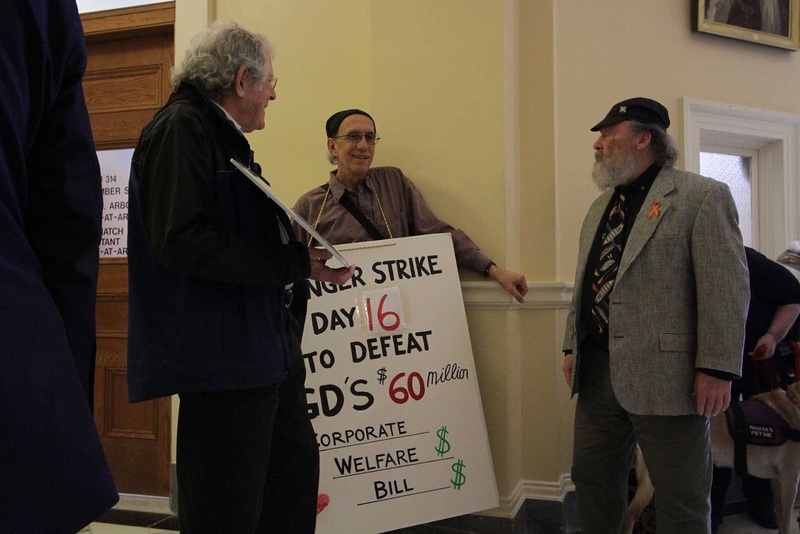 A legislative committee appears to favor the $60 million in incentives but delays a vote on the 16th day of an activist's liquid-only diet. 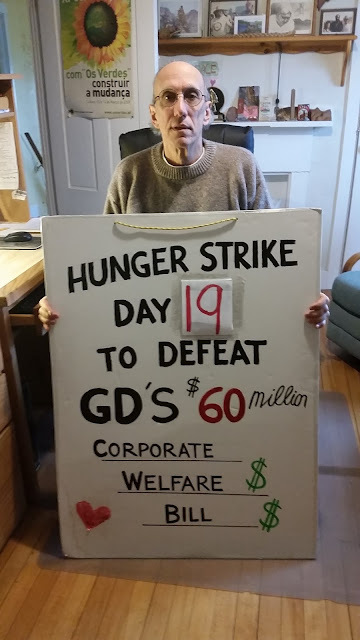 On the second day of our recent trial for civil disobedience at Bath Iron Works in 2017 the Sagadahoc County Superior Court Justice Daniel Billings dismissed the charges and stated, "Basically the [Bath] police department is outsourced to BIW [Bath Iron Works] on these events...."
Based on recent experiences, during this statewide campaign to oppose $60 million in corporate welfare for BIW/General Dynamics, I'd like to expand on the judges words to say - the local newspaper in this community (the Times Record) has been outsourced to BIW/GD and the Maine State Legislature has been outsourced to BIW/GD. Maine is a corporate colony and democracy does not truly exist here at this moment. I don't think I am exaggerating this claim. All one has to do is look at recent issues where the state legislature has bowed to the power of JD Irving Ltd on the mining issue; Nestle (Poland Springs) on the water extraction issue; General Dynamics on the corporate subsidy issue; and many more similar cases. Corporations like Walmart, Hannaford, L.L. Bean, Pratt & Whitney, Saco Defense, and others generally get what they want from the legislature and local communities where they operate. Over the years Maine has subsidized hundreds of corporate operations using various mechanisms to hand over taxpayer dollars supposedly in return for more jobs. But studies show that in most cases job growth at subsidized firms is considerably lower than the state average. There was no relationship between the size of subsidies received and the amount of jobs gained – as subsidies rose, job gains did not. A Maine Sunday Telegram investigation found that neither a $31.8 million loan nor the $8.2 million in equity investment—which was the basis for two investors receiving state tax credits—actually paid for improvements to the Great Northern Paper mill that shut down in 2014. Instead the funds were returned the same day to investors, never going into the mill for changes that could have saved jobs, and Great Northern filed for bankruptcy later that year. Hundreds of jobs were lost after workers were given false promises. What is happening in Maine is happening nationwide and even worldwide as the corporate agenda is clearly to hollow out democracy and retard social progress. 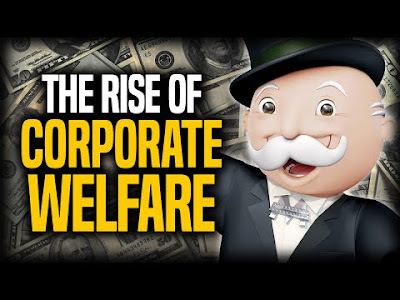 It is essentially a return to feudalism - this time corporate style. 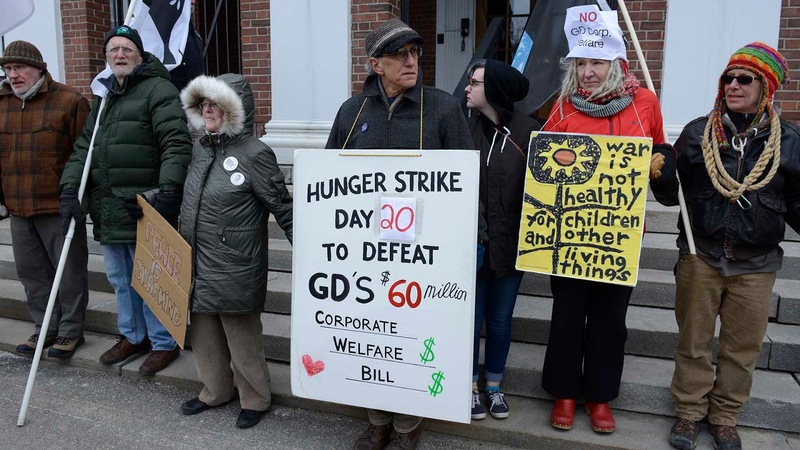 So our meager campaign here in Maine to oppose this give-a-way of a precious $60 million to GD is just one of many similar struggles currently going across our state and beyond. This video is based on the analysis of the Saker “Escalation in Syria – how far can the Russians be pushed?“. Saker is one of my favorite analysts - I've learned much from him since finding his site in 2014. This whole Russia recycled red-baiting is getting old - increasingly dangerous and is essentially being led in Washington by the Democrats. My, how things do change - and still remain the same. • I'd like some attribution to "43,000 kids living in poverty in Maine" — where did that number come from? • I haven't seen any reports that General Dynamics is "suggesting that if they don't get this $60 million then BIW might have to shut their doors and move." Does he have a source for this? 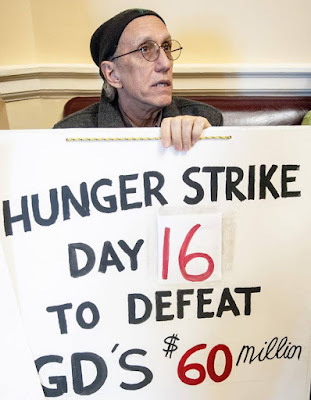 • If Bruce hasn't eaten since he went on hunger strike two weeks ago, how is he still able to demonstrate outside BIW? My responses to his questions did not seem to change the editor's mind and he refused to run the Op-Ed. So here it is and you can decide what you think. 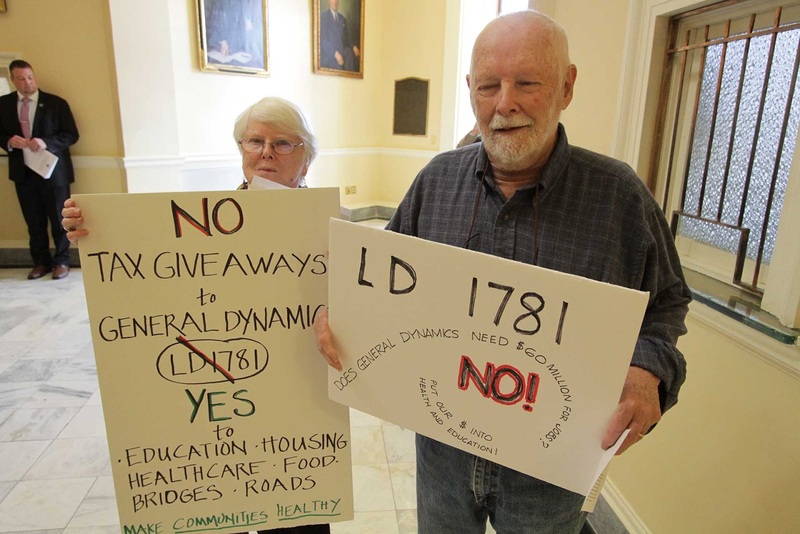 The Taxation Committee of the state legislature will likely vote ‘Ought to pass’ this week on LD 1781 [they actually delayed the bill until March 6] – the corporate give-a-way of $60 million to General Dynamics (GD). The bill will then go to the floor of the state House and Senate for final vote. 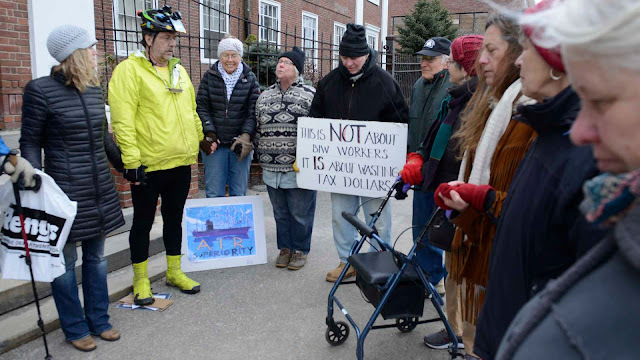 It’s been an interesting process to watch legislators, who complained about Sen. Susan Collins supporting the Trump federal tax bill, turn around and support a similar bill (on a lesser scale) in Augusta. And politicians wonder why citizens have become so cynical and many have given up on politics. The idea of truth, fairness and justice seem to get squeezed out of the process in Augusta just like in Washington. 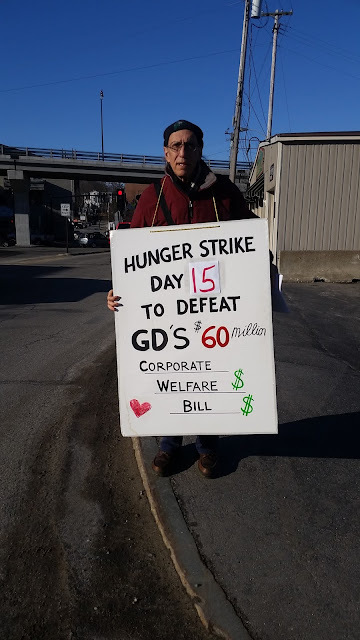 I’ve been doing a hunger strike against LD 1781 since February 12 and now about 25 others around Maine have joined me by fasting for days at a time. During this period I’ve been going down to BIW during shift change to stand with a sign and hand out flyers. I’ve had some very interesting conversations with workers. Some workers I met are not in favor of this corporate welfare bill for GD. 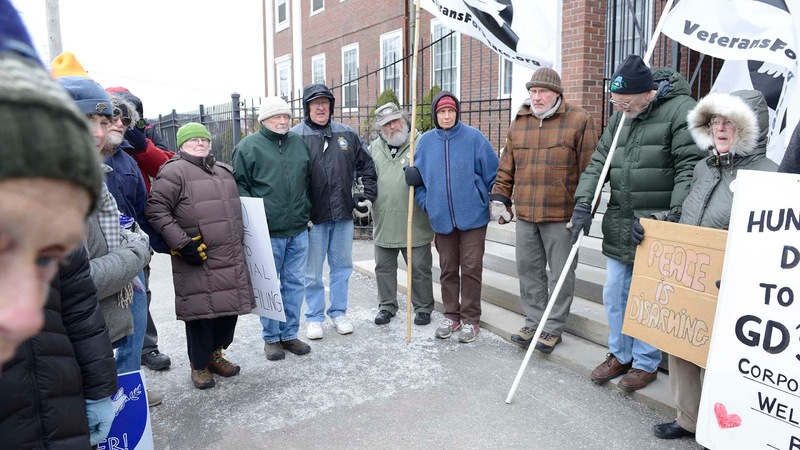 Two told me that they were angry about the last contract that froze wages for the next four years and forced give-backs in health and pension benefits. Other workers talked about the stock buybacks by GD – from 2009-2017 the company bought back $14.4 billion of its own stocks – driving up market share. Buybacks benefit corporate executives like GD’s CEO who made $21 million in 2016. It’s been quite rewarding to watch the level of interest and activity across Maine around this bill. 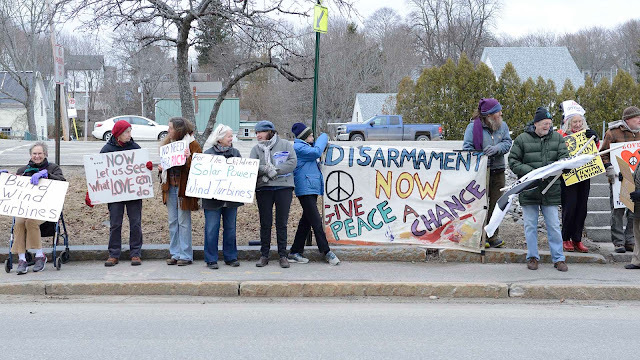 There have been more than 80 letters to the editor published in 20 Maine media outlets. People really do care about how their tax dollars are spent by Augusta. The fear card is constantly played by GD suggesting that if they don’t get this $60 million then BIW might have to shut their doors and move. Ridiculous. BIW is a money making operation for GD and the backlog of ships continues to grow. One important thing we’ve learned during the debate over LD 1781 is that when GD signs a contract to build ships at BIW all of their costs are covered by the tax payer funded Pentagon budget. Worker training, equipment, materials, wages, utilities and a healthy profit for the company are all included in the contract. We also learned that GD’s taxes owed to Maine are also reimbursed by the federal taxpayers under the contract. It is the job of the federal government to pay for the national defense. It is not the job of state and local governments to cover those expenses. But corporations like GD have upped the pressure on states like Maine (and Connecticut where GD is demanding $150 million) and cities like Bath that are hit up by GD for tax breaks. Corporations are in business for one thing and that is to make maximum profit. They don’t care where they get it as long as they succeed. But the role of government (local, state, national) should be to strike a balance to ensure all the needs of the people are met – health care for all, fully funded education, roads, bridges, water, sewer and other public services in good repair. In order to pay for those things government needs to ensure that tax dollars are properly spent to do the most good. In my opinion LD 1781 violates that mandate to do good. The public should be alarmed about this corporate welfare bill. Most conservatives complain about welfare for poor people but remain largely silent about tax dollars given to the corporate class. 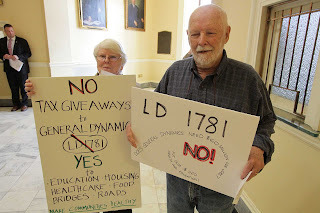 Generally liberals oppose corporate welfare but sadly most elected Democrats in the Midcoast are supporting LD 1781 because they fear they will not be reelected if they deny GD. They’ve put their own reelection above the needs of those who presently suffer from poverty and neglect in Maine. To me that is a real tragedy. Mark Roman (Solon), Mary Donnelly (Brunswick) and Jason Rawn (Lincolnville) give a short run down on the status of LD 1781 corporate welfare bill demanded by BIW/GD. Video by Martha Spiess (Freeport). Ten of us gathered this morning at the state capital in Augusta before the House and Senate members began entering their respective chambers on the third floor. We spread out along the hallway between the two chambers with our signs and flyers that outlined our opposition to LD 1781 - the $60 million corporate welfare bill that General Dynamics is demanding from the state. We handed out about 125 flyers to the elected officials, lobbyists and even a swarm of school kids on a tour of the capital building. We had quite a few conversations with various members of the House and Senate as well. Our presence was surely noticed and felt. Just after 12:30 we all gathered in front of the Taxation Committee meeting room where their 3rd work session on this bill was scheduled for 1:00 pm. LD 1781 was supposed to be the fourth item on the agenda but they moved it to the front of the queue and immediately said they had to table the bill for the third time due to the new language submitted by BIW/GD at the last session still not being understood. So we will be back at the capital on Tuesday, March 6. On that day we'll again gather at 9:30 am on the third floor between the two chambers with signs and flyers so we could use some more help on that occasion. Then at 1:00 pm we'll go down to the first floor to Room 127 for the Taxation Committee meeting. 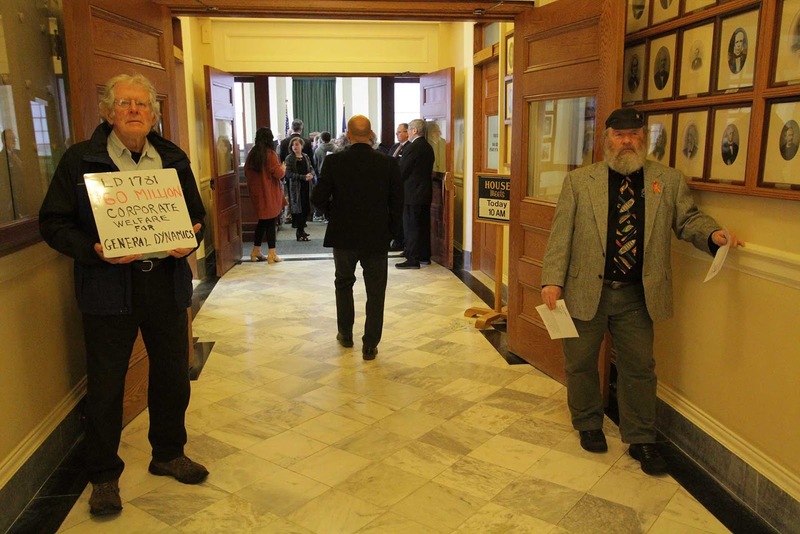 There are many ways to view these delays but it appears to me that BIW/GD are resisting some language changes that the legislature wants in the bill and likely negotiations are going on behind closed doors. 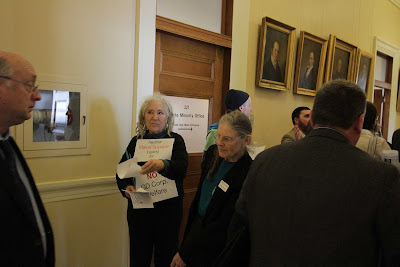 In the meantime the delay gives us more time to organize opposition and I can say with delight that people are working harder than ever across the state to stop this corporate give-a-way from cash-poor Maine. Our state has massive human and infrastructure needs that $60 million would go a long way in helping us deal with. So please keep contacting your state legislators and keep writing letters to local papers. In the meantime I remain determined to continue my hunger strike until the final votes are taken in the legislative chambers. 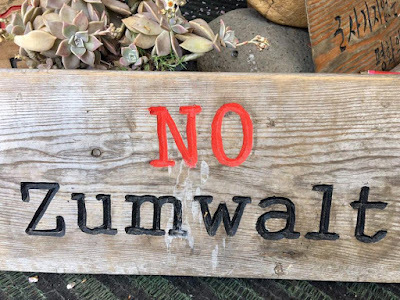 Day 15: Zumwalt to be nuclear equipped? 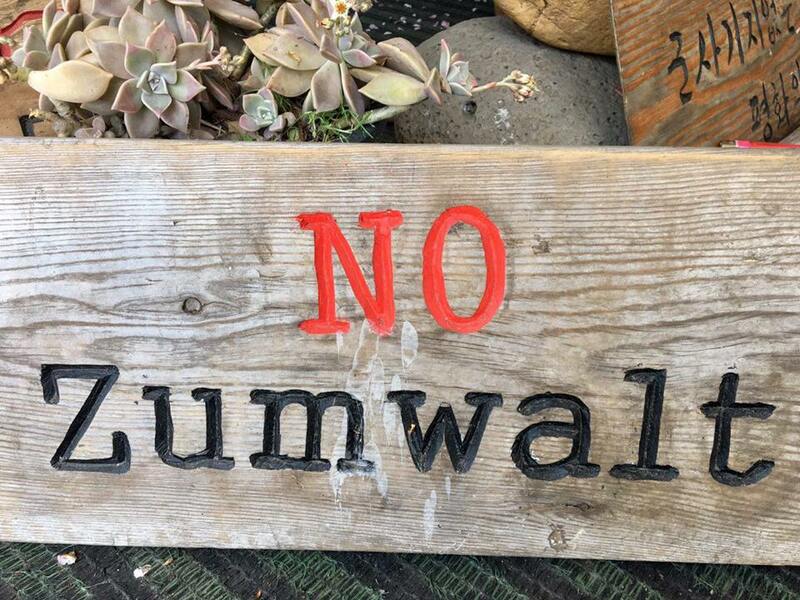 This is a message from Gangjeong village on Jeju Island, South Korea where the new Zumwalt destroyers will be porting. They are built at Bath Iron Works in Maine and might soon be equipped with nuclear-tipped first-strike attack cruise missiles. Went back to BIW at shift change time this afternoon. Not one worker taunted me - usually some young whipper snapper does but they were all subdued. My legs are quite shaky now - standing there for an hour is a challenge. In the morning I leave early for the state capital in Augusta where I will stand (along with some others) between the House and Senate chambers while they are in session. Then at 1:00 pm the Taxation Committee meets again to discuss the bill. We will be there for that meeting as well. Thanks to all those who are fasting alongside of me and I deeply appreciate all the kind words of solidarity from friends and family. Huge profit$ to be made by moving the arms race into space. The aerospace industry has long claimed that the arms race in space would be the largest industrial project in human history. They salivate at the thought of the $$$$ they can make. Dear friend Mark Roman, woodworker from Solon, Maine, was my latest guest on This Issue. 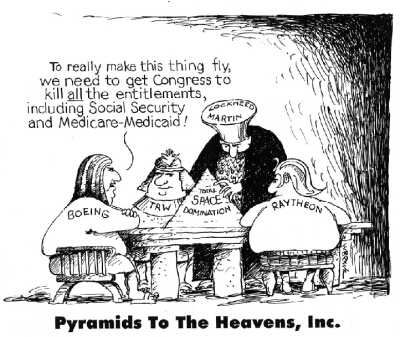 We discuss, of course, the $60 million corporate give-a-way bill for General Dynamics. Mark is one of the leaders in this statewide effort to stop LD 1781. The show plays on 16 local public access TV stations across the state.